Starting from an elevation of 5,300 m, the Brahmaputra river flows across southern Tibet, passing through the Himalayas, descending onto the Assam plain, and finally emptying into the Bay of Bengal. 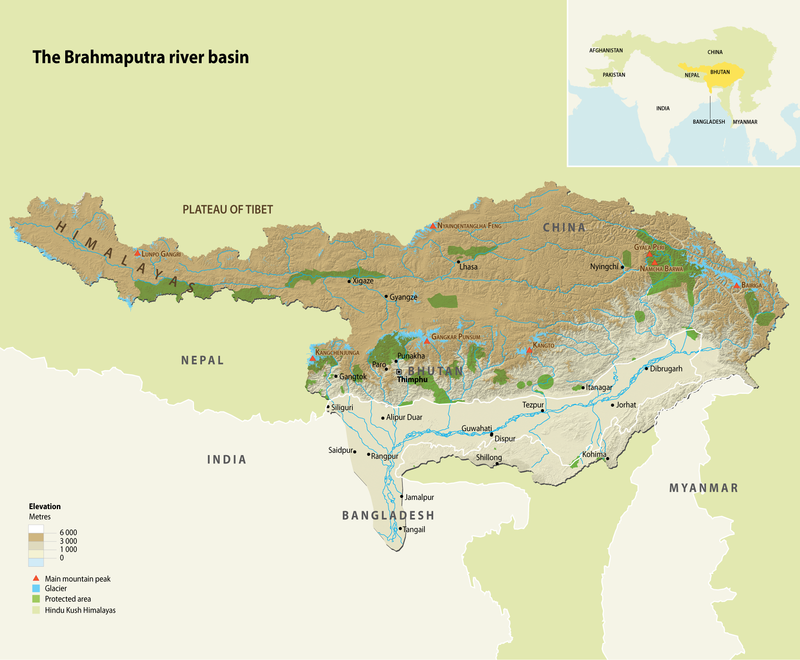 The river undergoes a dramatic reduction in altitude as it passes through one of the world’s deepest gorges in the Himalayas and enters the Assam plain, depositing large amounts of sediment downstream. 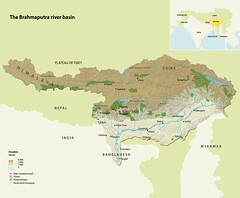 In the Assam and Bangladesh plains, the river flows in highly-braided channels (numerous channels that split apart and join again) separated by small islands. The river relies on both the monsoon and snow and glacial melt and, as such, is characterized by a large and variable flow.78 The monthly average flow rate varies from 3,244 m3/s in March to 44,752 m3/s in July. The average annual flow rate is 19,160 m3/s, the fourth highest in the world.